For a line called Generations, Hasbro's Transformers sub-line hasn't half been shy about featuring anything other than 1980s characters. So hooray for the 'Thrilling 30' which has finally got around to tapping into characters from some of the other tent-pole lines the brand has had over the years. 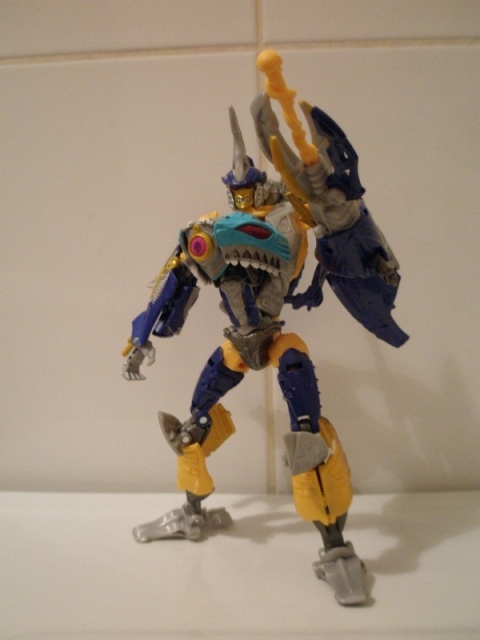 Sky-Byte here is the sole representative from the original Robots In Disguise line which debuted in 2001. RiD was largely just a straight import of Takara's Car Robots series, designed to be a bit of filler whilst Hasbro worked on where to go next following the poor reception of Beast Machines. It was probably the last time I was genuinely excited about a main line Transformers series, as I thought the toys were marvelous (and I still do). The supporting cartoon was, in some respects, a step back from the 'serious' science fiction the previous five years had given us in the form of Beast Wars and Beast Machines, and was arguably the first time a lot of western fans got a chance to see the Japanese take on Transformers. The show was bright, cheerful and about as deep as a puddle, full of largely simple plots and cops and robbers style shenanigans with some overarching plots thrown in, lots of power ups, shouting and epilepsy-inducing transformation sequences. The good-guy Autobots were largely a boring bunch of nondescript do-gooders with personalities so nebulous they remain half-forgotten today. The villains, on the other hand were fab. In a bit of a mash up, this time the Autobots faced off against Megatron and his Predacon lieutenants, three bumbling half-wits lead by the gloriously vain and self-important Sky-Byte. A stand out character from the show, Sky-Byte spent much of his time trying to retain his position as second in command whilst dealing with the incompetence of Dark Scream, Gas Skunk and Slapper. He spent of his down time reciting haiku poems and dreaming of glory, but ultimately lost his position to the brutal Decepticon Scourge. Still, being a sensitive and artistic soul, he was rewarded with freedom, swimming off into the sunset at the end of the show, whilst his comrades lay deactivated or incarcerated. 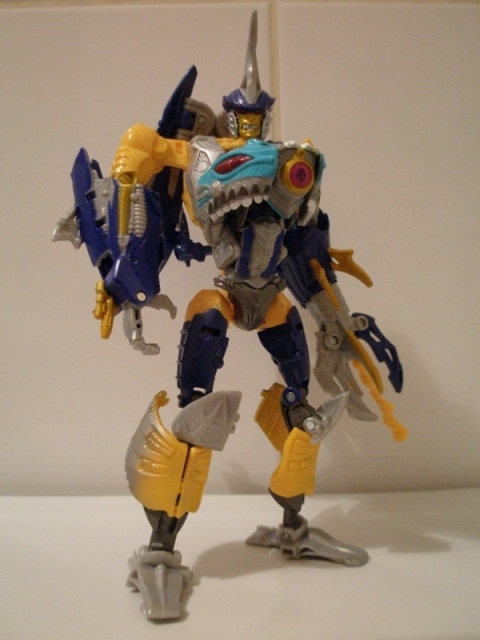 His accompanying action figure was a very pretty repaint of the Beast Wars Transmetal 2 figure, Cybershark. It's one of the loveliest looking Transformers toys ever brought to market with its lush paintwork, chrome, and general colour scheme. It was also a bit of a problematic figure, the idiosyncrasies of the design left you with an awkward looking robot mode and a fearsome great white shark that didn't quite hang together so well. So does this Generations version improve upon what we've already had? Sort of. 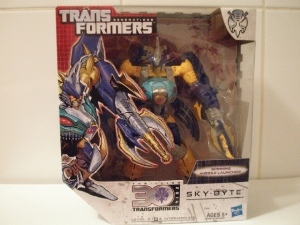 On the shelf in his box, Sky Byte looks quite beefy and burly, but he's actually not. He's surprisingly thin and a shade taller than he used to be. I did think he looked a bit too thin, but the more I've played with him, the more I've realized that he's actually very well proportioned. He's remarkably uncluttered in robot mode too, which is a huge improvement over the original toy. The various shark parts are mostly concentrated in the 'wings' that are tucked away on his back. This means he's way easier to play with, pose and handle. To accommodate the alt mode, some choices have been made to the robot mode design that I can't say I'm overly fond of. Whilst the shark head chest is great, he has this awkward 'hunchback' look about him � his shoulders are set back behind his neck and to get the best look out him, you have to keep his legs slightly bent at the knees and his torso tilted back ever so slightly. Otherwise, he ends up staring at the floor. Elsewhere, whilst improvements have been made to the left arm's 'Hurricane Hordak' design, the right arm repeats the problem the original toy had. There's no wrist, which leaves his hand looking uncomfortable and never very natural. I'd have happily forgone the poseable thumb in favour of a ball jointed hand/ wrist assembly here � there's definitely the space for it, so its odd they've just plumped for a hinge. The detailing and colours are great though. He doesn't really miss the chrome and grading of the original toy, replacing them with some very vibrant and pleasing yellows, blues and a lovely silvery-grey colour (so glad Hasbro didn't just use their usual boring grey plastics here) that are just as strident as the original's paintwork. The head sculpt is a bit bloody ugly though. Its more Austin Powers than snarling Predacon. 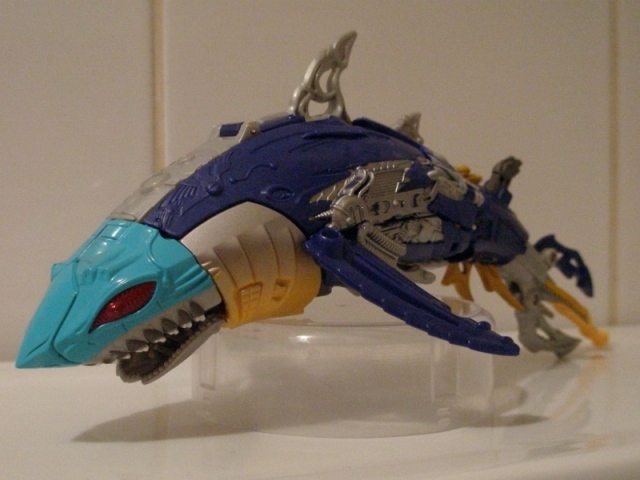 The original's alt mode was more obviously recognizable as a great white shark, whilst this is just a very angry looking fish. Its a very pretty one, mostly blue and silvery grey, with the turquoise fish face being a good compliment to the techno-flesh of the body. Love the blood red eyes and the overall detail and look of this, like it's jumping up out of the water. Which surely makes this some form of spawning salmon. Pretty though it is, there's jack you can do with it really. You can still access the spinning gimmick and launch a missile, but there's no major posing to be had. In that, he's no worse than his original toy and any other beast-former you care to mention.